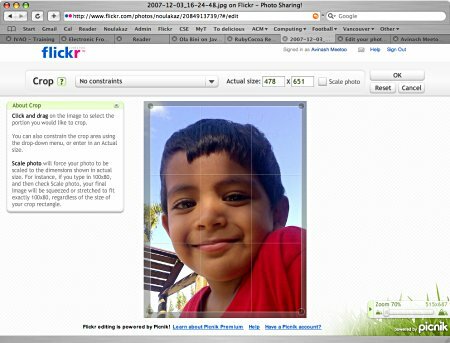 Flickr has recently announced that it has partnered with Picnik to allow users to edit (e.g. crop, resize, rotate, correct colors, remove red-eye, add borders, etc.) within their browser. yes yes, it’s pretty awesome and very useful. I suggest that you backup the original picture first (create a temp. album for editing). i’m waiting for an update from flock (web browser) to offer full support for the editing feature in flickr.